In December, the majority of the team (BeeGee, Jack, and Jarrett) met up for an easy backpacking trip at Pedernales Falls State Park. It was a great trip and the weather remained mostly nice. There was no rain and the weather never got too cold. Follow the adventure with Day 2 and Day 3. 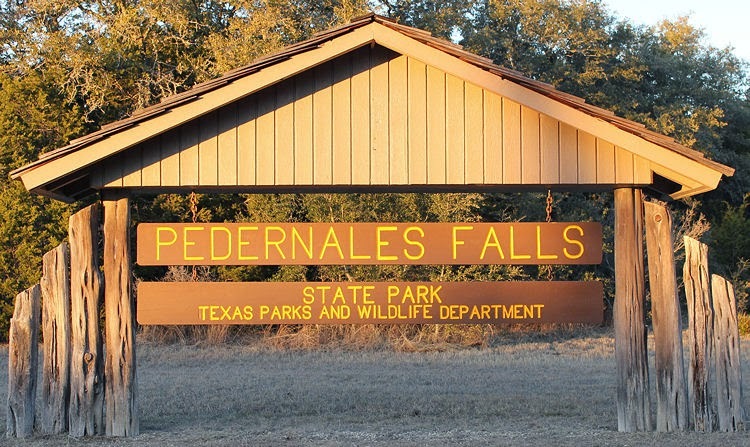 Elevation: 900 to 1090 ft.
Pedernales Falls State Park is over 5,000 acres and the scenic Pedernales River runs through the park. Pedernales Falls is near Johnson City. The park itself was purchased in 1970 and opened as a state park in 1971. The trails are mostly old 4x4 tracks that were used by the previous owners to transverse the ranch. The nice thing about the wide trails was they frequently paralleled small canyons created by the abundant creeks in the area. The vegetation is mostly oak, elm, cypress, and cedar (juniper) trees. To start almost any adventure, BeeGee and I have long drives to start all our trips. The drive from south Texas to the hill country is over 5 hours. Upon nearing the hill country, we made a quick detour to pick up Jack. After this, it was more driving to finally get to Pedernales Falls State Park. BeeGee waiting for the long drive to be over. 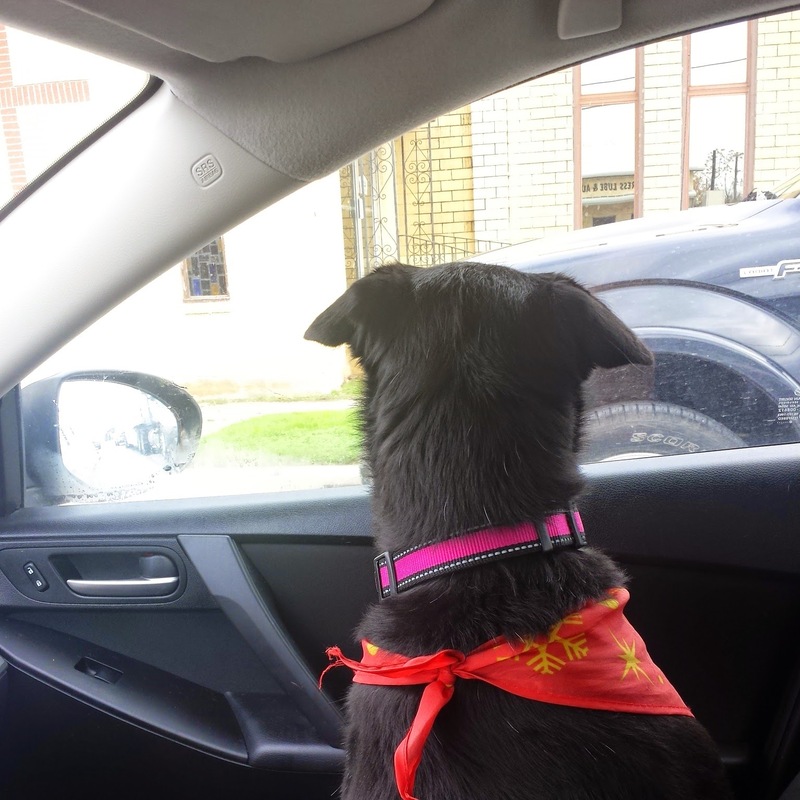 She is on the look out for adventure. We finally arrived, parked at the primitive camping trailhead, and set off to find a good place for our campsite. The trail for primitive camping is also the Wolf Mountain Trail. It was pretty close to dark when we started our 2-mile trek to the campsite area, but the trail was mostly smooth and easy to walk even in low light. BeeGee and Jack walking to the primitive camping area. The trails were wide and easy for the most part. One of the first sites we came across was a large Oak tree and a small placard. The sign presented general information about oak trees and how they grow in the hill country. The oak tree itself looked a little out of place, but the placard was an interesting read. Further along, we crossed 3 small streams, Bee Creek, Mescal Creek, and Tobacco Creek. It was a little chilly out, so BeeGee was less interested in lying in the water than normal. The Large Oak Tree and Placard. Make sure you stop by to learn a little more about oaks in the area. We arrived at a fork in the trail where left went to the campsites and right continued on the Wolf Mountain Trail. One of the most memorable aspects when reaching the primitive camping area is the ominous sign warning of flash floods below the bluffs. While it was fairly dark by this time and it was easy to tell where the bluff was, I couldn't help but feel a little nervous about setting up my tent in the flood plain. The first creek we crossed was Bee Creek. Most creeks in the area look fairly similar. We found a pretty good campsite tucked back in a few trees to offer a little privacy. Then we went straight into making dinner, which was just boiling water and adding it to dehydrated meals. While our meals were reconstituting, we set the rest of our campsite in the dark and sat down for our dinner. After our quick meal and a little chatting, we headed to bed. BeeGee getting ready for bed. She is wrapped up in a fleece blanket to keep warm on a chilly night. The entire primitive camping area was sparsely populated and it was almost completely silent. This probably had a lot to do with the sun going down so early and it was a very dark night. That is one of the biggest issues with winter camping, you can get up to 12 hours a day of darkness. Stay tuned for days 2 and 3 of our trip to Pedernales Falls State Park. If you like the blog, go ahead and follow us on Facebook.